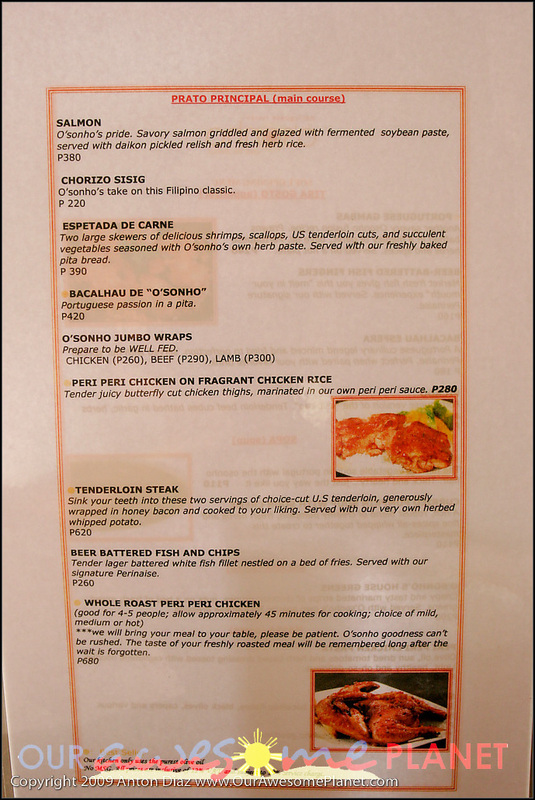 I’ve been looking for a Portuguese restaurant ever since my favorite Portuguese restaurant in Boracay closed down. 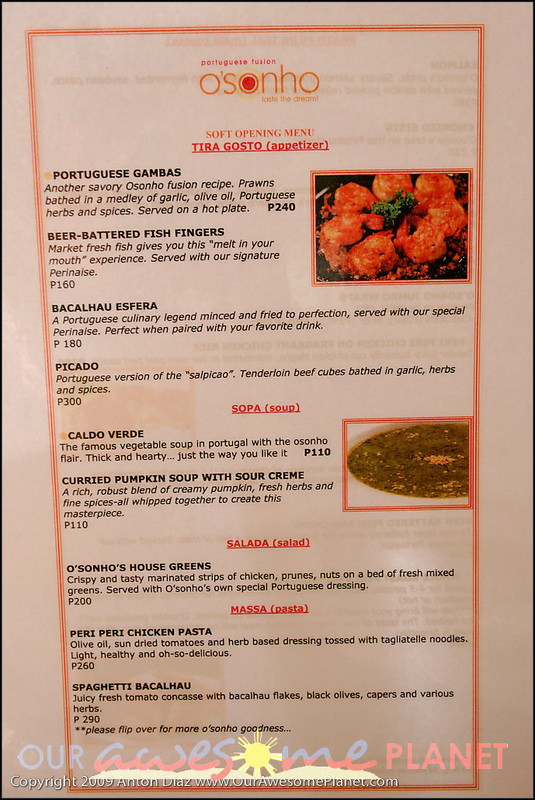 Banza Portuguese Restaurant in Station 3 was one of my top 5 restos in Boracay. I’ve been craving for a Portuguese paella ever since. O’sonho stands for “Dreams” in Portuguese. (I forgot to ask the owners why.) They are on soft opening, so their menu is limited at the moment. Hopefully, they would offer the Portuguese paella when they expand their menu. Portuguese Gambas (P240 +SC). Another savory O’sonho fusion recipe. Prawns bathed in a medley of garlic, olive oil, Portuguese herbs and spices. Served on a hot plate. We liked this spicy twist to gambas, served with pieces of pita bread on the side. 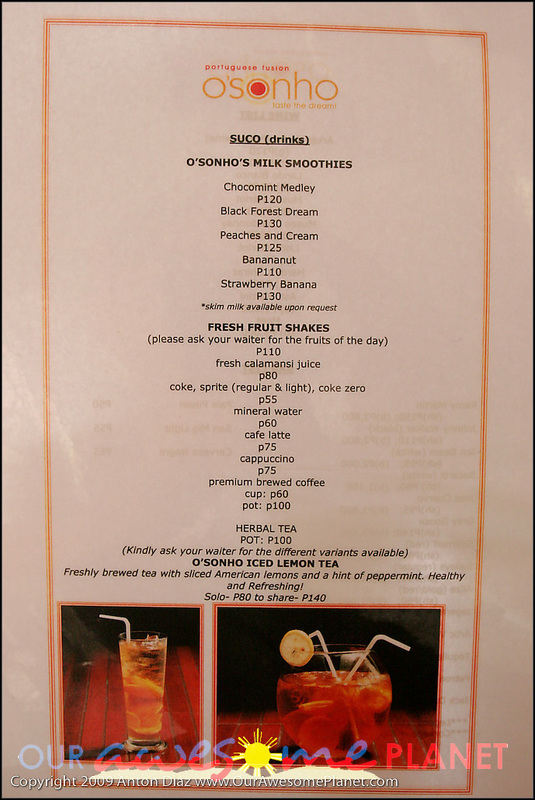 The serving size is small, though, and eating one shrimp would cost P44. Picado (P300 +SC). The Portuguese version of the “salpicao”. Tenderloin beef cubes bathed in garlic, herbs and spices. It looks oily but it is not. O’sonho uses the purest olive oil and they don’t use any MSG at all. What is left is the pure taste of garlic, herbs and different exotic spices. The only thing is their “salpicao” version has a sour twist (maybe because of wine). It is an acquired taste, and some people do love this dish. Beer-Battered Fish Fingers (P160 +SC). Market-fresh fish gives this “melt in your mouth” experience. Served with O’sonho’s signature Perinaise. It was ordinary, but Aidan ate most of it. Chorizo Sisig (P220 +SC). O’sonho’s take on this Filipino classic. The sisig is served on a small, circular hot sizzling plate. Adding chorizo was a nice touch. It made the Filipino sisig into a Portuguese fusion dish. Peri Peri Chicken on Fragrant Chicken Rice (P280 +SC). Tender, juicy butterfly-cut chicken thighs, marinated in O’sonho’s own peri peri sauce. We loved O’sonho’s Peri Peri Chicken — all of us were raving about it. The chicken is marinated in O’sonho’s signature peri-peri sauce, which is also served on the side. I like the herb-y taste and spicy kick of the chicken. The serving size is just right. You’ve got to try this! Most of us even commented that this is better than the Peri Peri Chicken in Promenade, Greenhills. Text and Photos by Anton Diaz. 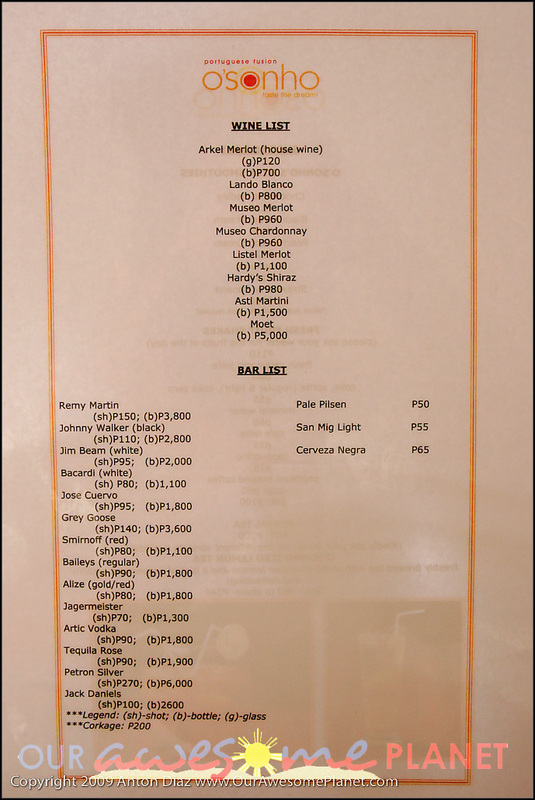 Copyright 2009. What makes Portuguese standout ba? I only know that it’s a bit on the sweet side, is it? Sisig?! Salpicao?! Fried fish fingers with Mayo?! Gambas?! They added chorizo (which may not be Portuguese chourico) then its now called Portuguese Fusion? BTW, fish fingers like that looks like it came from frozen white fish meat you get from Cold Storage or S&R at around P200 per pack. So this is a fusion of what exactly? Portuguese and Dencio’s? Please lang. Can’t restaurateurs come up with something that doesn’t feel like they’re dumbing diners down? ohhh just when I don’t work in makati anymore 🙁 looks interesting! thanks anton!! I agree with Acid and Chinkee – why can’t they have authentic and be authentic?? Chorizo sisig in a Portugese Restaurant?? the problem w/ restaurants here is that the owners’ primary goal is still to make money, with elevating the current restaurant scene a far second. that’s why we will always have more of these mediocre restaurants. this also holds true for those high-end/gourmet restaurants, where 90% of the time you will see caesar salad, foie gras, sea bass and now wagyu on the menu. it’s like everyone is reading the same idiot’s guide to opening your restaurant (and recouping your investment in a year!). sad. Isn’t there a portuguese restaurant in White Plains? Also, try going to the market at temple Drive, there’s a couple selling portuguese food. i wish they’d watch No Reservations – Azores for a bit of inspiration. It’s on Season 5 (same as NR – Philippines) but is available on youtube in 5 parts. tried the chorizo sisig and thought it was nothing great. the peri peri chicken was good, skin very tasty, but i’m not sure if worth going back to. i also like peri peri in greenhills, can’t decide which one i like more. My family and I tried O’sonho and all we can say is “wow”! We ordered the sea bass, ribeye, per peri chicken, lamb and bacalau…everything was so yummy. We thought it would be really expensive and even had to look at the menu again to check on the prices once the dishes came out. They were quite large! I especially liked the interiors…very cozy and private…so different from the other noisy and messy restos around. The only downside is we had to wait for a table. maybe the management can have seats outside for those waiting. But over all, it was definitely worth the wait! Anton, where is it in Jupiter? any landmarks? The food was good, nothing great to write home about, but the WAIT for the food was horrible. I waited ONE HOUR for my lamb! Suffice to say, I never went back. Or rather, I have no plans to go back, especially if I have a seriously growling, empty stomach. O’sonho’s peri peri chicken is just fine with me. But it’s taste is far different from that of Nando’s peri peri chicken. Nando’s for me i think is more authentic. Amongst all the food we ordered, I only have 2 favorites: the chorizo sisig and the gambas. I super love Portuguese food and i think O’sonho’s didn’t meet my expectations.